Thirsty Pilgrim: Ooohs and Ahhhs in Bamberg. Ooohs and Ahhhs in Bamberg. 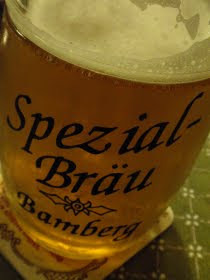 Beer geeks all know about Bamberg, but how do you explain it to more normal folks? 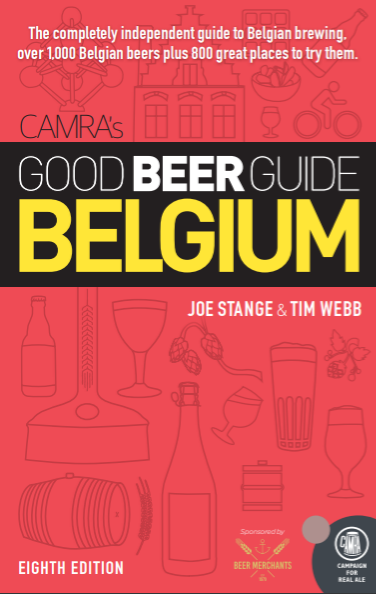 Maybe like this: It might have the highest per capita quantity of quality beers in the world. That is to say, it makes many more great beers than a town that size should. Something like that. Anyway, we were there last Saturday. Part of our farewell tour. And it's a good thing the most memorable beer of the day was so memorable, because I forgot to take a picture. I guess I was too busy enjoying it to bother. On the way to Mahr's Bräu from Café Abseits — walking through a pretty drab suburban area but with a buzz so pleasant we didn't care — we passed a beer-touring British couple. The Steve Thomas guide poking out of her purse gave them away. So we flagged them down. The long-haired fellow told us to go and order at Mahr's by saying "ah-ooh." The "ooh" representing capital U for Ungespundet — Mahr's unfiltered lager, served via gravity from the keg. We followed their advice and received our mugs of copper-colored love. Highly quaffable, as if you didn't know, with a nice hairy bitterness and fruity notes that reminded me of orange zest. I had to have another and the rest of the day was a blur. Thirsty Junior, all of nine months old now, decided not to join us in Bamberg. He stayed with his adopted Swabian grandmother and thus could not have known about Mahr's Bräu. Yet I swear to you, next morning at breakfast, amid his growing repertoire of syllables, he clearly ordered an Ungespundet. *The photo is of another Ungespundet in town. Very tasty, but not so amazing that I forgot to take a picture. Glad you made it to Bamberg! Now you see why I go back once or twice per year for the last 8 years! :-) And sitting in Mahr's drinking "U" is a daily event for me while I am there. The Costa Rican Beer Scene, Such As It Is. New Beer on the Way from Jandrain-Jandrenouille. This Post is Perfect for the Climate.